"She's a rose with thorns, don't mess with her. She's a girl who goes to extremes. When she can, she soothes; and when she wants ... ! Her fragrance lifts you higher, she rocks and shocks." Is she a Dietrich-like woman of 1930s Berlin who visits smoky cabarets with dangerous men who may or may not be her lovers? Or is she a young girl growing in semi-ruined Soviet-occupied Berlin post WWII? Or is she from West Berlin during the clubbing and drug days of the 1970s? Most evidence point to the latter days options, by the way (see the footnote in Robin's review of La Fille de Berlin on Now Smell This, also the fact that the fragrance ties in with an exhibition and a photography book of Lutens work that feature women in Berlin between 1967-2008). But it doesn't matter much. Serge Lutens perfumes are first and foremost an expression of Uncle Serge himself: his memories, emotions, aesthetic, identity. 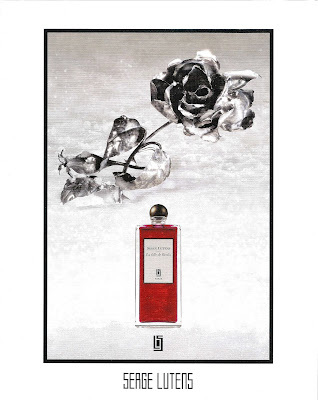 In La Fille de Berlin (composed by Christopher Sheldrake, a man who probably knows his boss more than anyone else), Lutens go deeper and darker with his use of rose. 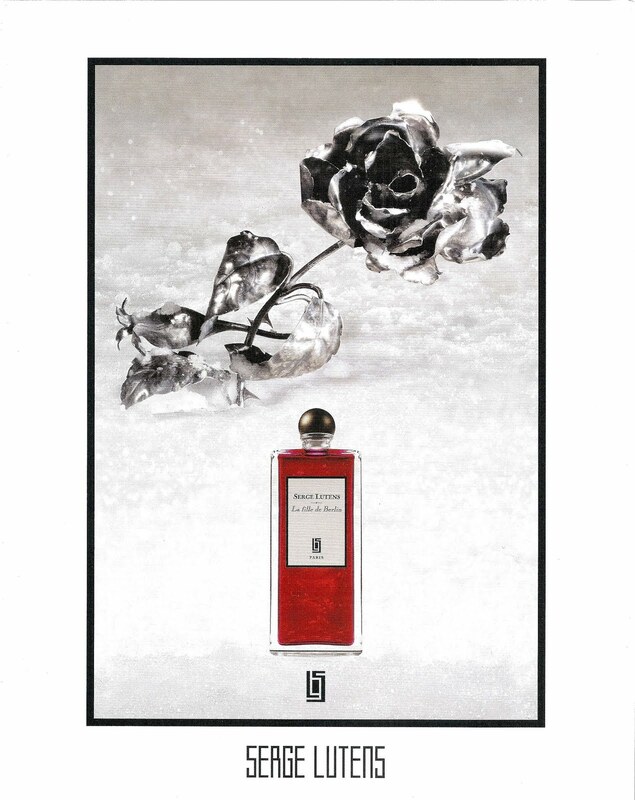 If Sa Majeste la Rose is sunny and smiley and Rose de Nuit is a very come hither (and let me bite you) fragrance, Le Fille de Berlin is more introverted. It has many familiar elements you find in other rose perfumes: a sweet jammy delicacy, a hint of green-- leaves and dew, pepper and berries. Yet this fragrance is darker, more personal*, intimate and warm. La Fille de Berlin is only slightly animalic; there's no invitation for debauchery, but the sensuality is intrinsic, it's part of the person, part of who you are when you wear it, if you let anyone come close enough. The dry-down is a delicious rosy amber with a side of high quality musk. It's a lot more Lutensian than the earlier rose perfumes in the line, honeyed and slightly woodsy. A couple of years ago there was some disgruntled soul who didn't like De Profundis and called for Serge Lutens to retire and be done with it. I'm very happy Uncle Serge didn't pay attention. *It's interesting to note that in his most recent interviews Serge Lutens has been opening up like never before. He actually talks about himself in detail (see this piece from The Independent and don't skip Luca Turin's comment at the bottom). There was also an interview to a German publication where he even revealed that his middle name is Lucien, after his biological father. Serge Lutens- La Fille de Berlin ($120, 50ml EDP) is available from all the usual suspects, starting with Luckyscent and ending with top department stores. Also on parfum1.com and sergelutens.com. I am very curious to try this one. Also, thank you for the link to The Independent piece. Lutens' own words are the best part of it; the "nose" confusion is hilarious but a sad reminder that the general public has no idea of what goes on in perfumery... these are the same people who think that celebrities actually concoct their own fragrances. I read the interview (think it was German VOGUE?!) and was thrilled about it, Serge talked about his childhood & his mother. Though I deeply dislike Berlin, I deeply love Serge and roses, so I am really curious about this! I like that you mention he is NOT the perfumer, but Sheldrake; still, the Serge artistic concept is cauht in every piece he sells. I am craving some make-up from his line (ohhh so expensive! one lipstick at least!) just because I admire him&his work.